Canot-camping et immersion linguistique AN-FR, 8-11 août! Canoe-Camping and FR/EN Immersion, Aug. 8-11! Venez apprendre le canot-camping lors d’une immersion totale dans la nature québécoise! J’animerais un échange linguistique anglais-français en même temps – 3 jours d’immersion linguistique efficace et agréable ! Nous irons à la magnifique réserve faunique La Vérendrye, à 350 km au nord de Montréal. Nous allons apporter nos tentes, bouffe etc. dans les canots, pagayer et camper à un endroit différent chaque nuit. Une expérience typiquement québécoise, totalement dépaysant et simplement géniale. Mes vacances préférées sont toujours en canot-camping. Le coût est de 280$ (260$ nouveaux arrivants), incluant : transport par covoiturage (que je vais organiser), location de canots, tentes, sacs de couchage, barils etc., animation, guides, organisation, accès à la Réserve et sites de camping. Ça vaut vraiment le coup ! Nous allons faire l’épicerie et les repas ensemble ; la nourriture est en sus. Départ de Montréal le 8 août (jeudi) vers 14h ; retour le 11 août en fin de soirée. Inscriptions : Le coût est plus taxes et une carte de membre annuelle de 10$ à l’Association récréative Milton-Parc. Places limitées ! Pour s’inscrire : Inscriptions : www.miltonpark.org, 3555 St-Urbain. Pour questions : 514.872.0566, [email protected] DERNIER JOUR pour s’inscrire = vendredi 2 août. On aura une réunion de préparation de la sortie le 2 août en soirée. Cette activité est organisée en collaboration avec la Fédération québécoise du canot et du kayak, et la Maison de l’amitié, avec le soutien de Mountain Equipment Co-op et Patrimoine canadien. Merci ! Come try out canoe-camping and immerse yourself completely in nature ! I’ll be leading a French-English language exchange during this outing, so it will also be a fun and useful language immersion at the same time! We’re going to the spectacular La Vérendrye Park, 350 km north of Montreal. We’ll pack all the tents, food etc. in the canoes, go out paddling and camp in a different spot each night, to do a full loop. This is a typical Quebec experience, will allow you to completely disconnect from city life and will be just incredible! My very favourite vacations are always while canoe-camping and I hope you’ll have the chance to try it with us. The cost is $280 ($260 for newcomers to Canada), including transportation by carpooling (which I will organise), rental of canoes, tents, sleeping bags, barrels etc., guiding, organising, Park access and camping fees. It will be completely worth it! We’ll be grocery shopping and cooking meals as a team; food is extra but should be reasonably-priced. We’ll leave Montreal on August 8 (Thursday) around 2 pm, and will return on Sunday August 11 at the end of the evening. How to sign up: Note that taxes and an annual $10 membership card to the Association récréative Milton-Parc are extra. To register: www.miltonpark.org, 3555 St. Urbain. Questions? Call us at 514.872.0566, [email protected] LAST DAY to register is Friday August 2nd. We’ll have a preparatory meeting in the evening of August 2nd. This activity is organised in partnership with the Maison de l’amitié and the Fédération québécoise du canot et du kayak, with the support of Mountain Equipment Co-op and Canadian Heritage. Thanks! Previous article8 sorties à vélo cet été! 8 bike outings this summer! Next articleKayak de mer, rando et échange linguistique AN-FR, 13 juillet! Sea Kayaking, Hiking and Fr/En Exchange, July 13! This sounds great- how much canoeing is it per day? Are you expecting people to have experience canoeing for long periods of time, or is this for people of all levels? 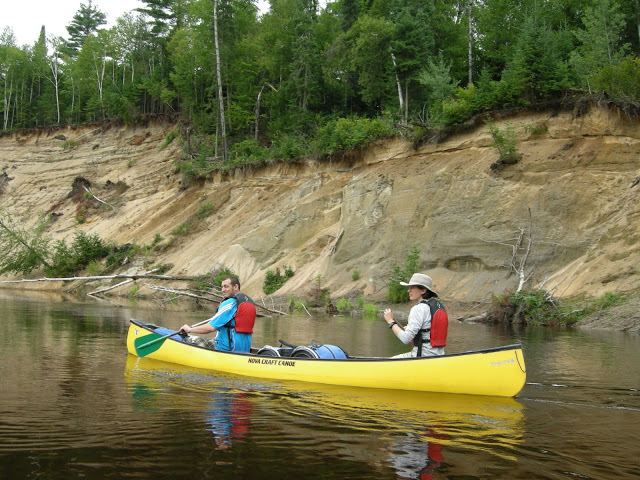 Hi Randy, the trip is for people of all levels, even if they have never canoed or camped before. We'll be doing 34 km of paddling, divided up over 3 days. This is a decent amount of canoeing – we'll be canoeing for most of each day, but with breaks of course (to have snacks, lunch, swim!!) It will be a great trip for people who enjoy active, sporty vacations. We'll for sure be tired at the end of each day, but it's definitely doable for anyone who is keen, in reasonable shape and willing to be outside and active for the 3 days! There will also be a few portages, though nothing too long, just enough to stretch our legs! Don't hesitate if you have other questions!